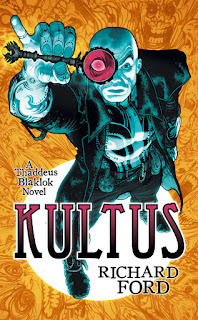 My second foray into the esoteric steampunk in - well, twice- as many days, Kultus represents a very different read to the other. Thaddeus Blaklok is hard to describe as a protagonist: though a nastier Harry Dresden with violence as first choice comes close. Actually, the more I think on it, the more I realise that that's an accurate comparison. He's even got a worse penchant for property damage! So we've got our protagonist - and when he's hired by a demon to retrieve the Key of Lunos, we've got our plot as well. This isn't some simple retrieval mission, however: the Key can open gates to Hell. And demons seem remarkably fashionable in Kultus - because everyone seems to want a piece of apocalyptic action. It's one of the fastest paced fantasies I've read, and that's the main cause: the viewpoint isn't simply focused on Thaddeus. We get sections from whoever's got the Key at the time - which makes the plot not so much of a chase, more of a book length brawl with demons allowed. I'll admit I didn't get into Kultus immediately. For the first couple of chapters, I wondered what all the fuss was about - Thaddeus' methods seemed confined to the mundane. But by the fourth? I was absolutely hooked. Thaddeus Blaklok reveals more than a little towards the end of the book; the (numerous) fight scenes become inimitable fun - and imaginitive as well. What do I mean by that? A thug punching an opponent isn't fun. Harry Dresden hurling a Denarian is. No more explanation needed for that comparison. The ending in particular left me wanting more, but enough was resolved so as not to need it - the perfect balance. Before I go into more praise, however, I'll give a small warning: this is not for younger readers. Thaddeus Blaklok isn't light on either violence or profanity. If you're fine with, say, Abercrombie or Martin, this shouldn't faze you, but for YA readers, check what they've read first. Anyway - disclaimer over with! This is fun, fun fantasy - not deep, rarely serious, but fun. And what more do you need? Kultus is what happens when you shove steampunk, ambiguity, and a whole lot of verve together: it's relatively short, very refreshing, and absolutely marvelous to read. Quick off topic note: I stumbled upon this blog a couple days ago and have now read a dozen or so articles, and am enjoying it very much. Thank you for your work! Long live Guy Gavriel Kay. Thank you! Really glad you're enjoying it - and of course, always a pleasure to meet a fellow member of the Cult of Kay.